Not today but a week ago. My phones charger got a loose connection in the head, pin, plug or whatever the English term is, and where I am probably not going to be able soldering it. I took my spare one which has already its wires showing in all directions. No wonder it became the spare one... It broke completely after one day. Too Lazy to go into city, I just ordered one and the seller sent me the wrong one that didn't look anything like it and had a different pin. Now I need to grab my soldering kit after all and turn that broken spare one into a functioning primary one. A silver backed mirror? No. But I do have a large silicon wafer. But thinking about these interlinked events, since the energy vampire is in 3D time, and these events happened at relatively the same time in space, is it more than the vampire chewing on a cord and coincidentally the people that fell victim happen to meet each other later that day? Or was the vampire, say, specifically chewing on one of our devices, and since we three were predestined to meet that day, there was a sort of "area of effect" attack/sucking of energy that happened in an area of time..? What's interesting is that my first instinct was to look to see if I could repair the plug-in adapter I suspected was the problem. The only videos I found on youtube that demonstrated how they could be repaired were done by Europeans. Replacement is more encouraged over here in the States than repair. One, it dumbs down the populace to the nature of physical science. Two, companies profit even more selling items that work just long enough to get outside of their warranty period. Three, some electronics they make almost impossible to repair unless you take a handsaw to them, as I have found out looking at my phone charger adapter. It's like they screw you on that end totally making you destroy the case to repair your own object, and if you don't have the tools or spare parts, which I don't, then they screw you over with the price of $20-35 for an OEM model or take your 50/50 chance a cheaper generic model for $8 will last more than a month. Two, companies profit even more selling items that work just long enough to get outside of their warranty period. Tell me about it. I had it happen to me a couple of times, almost to the exact day of warrant expiration. 15 years ago the isolation of a charger was at least five times as thick. Now it is so thin that you can feel the electricity on your skin as soon as you touch it. It has become so frail now that by holding the adapter end up into the air makes you wonder if the cable is going to break just by the mere weight of its own plug. What exactly is it with the hypnagogic "missing of a step"? Your body gives an immediate twitch, you are suddenly wide awake and usually forgot what happened. Did my thoughts wander somewhere where they shouldn't or what I am not ready for yet? Or was I just about to step into an abyss without realizing it? This realm and the other are out of phase by 90 degrees. For example, when awake, you are on a vertical axis. When asleep, you are on the horizontal. The hypnagogic and hypnopompic transitions are the rotation between them. The "real" realm of consciousness must convert to the "imaginary" realm of the unconscious, using a "complex number" of hypnos. Vertical and horizontal lines only require a single dimension--the transition, like the complex quantity, requires two dimensions be active, concurrently. This means you need a field of consciousness, not a point of consciousness, to make the transition without losing any data. Meditation, done properly, helps to build this field by keeping you in that hazy hypnos area, half awake, half asleep, which stretches stretches your consciousness into a field from a point. The best meditation is a 45-degree angle between waking and sleeping. The sudden transition happens when you cannot handle an angular change--and, like conventional thinking, moves in a straight line--EITHER horizontal or vertical, no slopes allowed. Learn and practice meditation, or sleep Minbari-style! When it happens on a more frequent basis, is it perhaps because I subconsciously want to maintain this angular phase for a longer period? I would have long started with meditation if it wouldn't feel so silly. I am just sitting there and have no idea what I am doing. I know there is a lot of literature on the subject giving a whole lot of advice and instructions but I was never too keen on reading it. Perhaps I should heed infinity's advice and just start doing it without any expectations and without reading anything about it. Just feel. Astral Dynamics by Robert Bruce was a valuable resource for me that you might also find useful. I'm not big on meditation proper, either. There are some techniques in this book that you can use to start working with energy in your body. This will expand your point of consciousness to a field of consciousness. There may be a copy of this in the Antiquatis library, but here's a link just the same. Yes, you were probably fighting the transition, until it got up enough "energy" to make the state change to the other orientation, skipping the middle bits. A "jump," rather than a "stroll" back to consciousness. In a forum like this where so many unbelievable possibilities are discussed it is sometimes hard to tell whether you are joking or dead serious - or a bit of both. I understood the 45° as an angle in the transition between consciousness and unconscious, not as an actual angle of the body in respect to the ground. 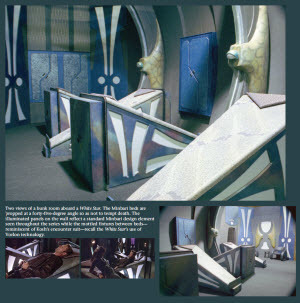 So just to be clear, a Minbari bed shouldn't have any effect on it, right? Sometimes, "as above, so below." The Minbari will not sleep horizontal, because that is where you "lay to rest" in death. The angle is symbolic of the "little sleep," half-way between waking (upright) and sleep, much like meditation is. Personally, the best meditations I have had was back when I had a recliner--kick back 45 degrees on it, and it was great. Having my ancestry in Tuttlingen, I resemble that remark! That is because the Germans, like the Norse, do not have an analogous god to Bacchus or Dionysus. I guess I could say, "what's the fun in that?" I would have long started with meditation if it wouldn't feel so silly. I am just sitting there and have no idea what I am doing. What you want to do is to put yourself in a state where you should fall asleep, but the position you are in does not allow it to happen. That way, your consciousness starts to drop off, but the body says, "wait a minute!" and keeps you just this side of sleep. That is the hypnagogic region, where you are sitting on the interface between the conscious and unconscious mind. Initially, there may be a lot of traffic flowing between the two--can make for quite a ruckus. But if you wait it out and observe what is going on, it calms down and you get a sense of internal relief. That point is where it gets interesting, because you are still awake enough to interject symbols, motifs and allegory into that region--and see how it transforms. When I meditate, I only seek that "stillness" because I know it is just a "clear channel" for subtle communication, that we normally can never hear over the drone of our complexes. But when you get there... it may appear empty, still or a void--until you broadcast something out. Internally, I call it the "Teal'c zone"... it only speaks when there is something to say. So give it the opportunity to say something. My phone did the same thing around that time... its an old battery so I figured that it was on the way out for good... it was doing this several days... be at 75% plus power available, then with almost no use shuts off showing 1%. Plug it in and its charging from like 60% level. Anyway that came and went, its now not doing that? Strange today a friend of mine asked me an odd question about why he and his grandson for no apparent reason became overly hungry yesterday... non stop atypical eating for both of them. He said he picked him up from daycare and an hr later after arrived home fixed a snack... hr after that ate supper like not eaten in days... then again an hr later.. went to bed and woke up starving in middle of nite? He had no idea why the both had the same non stop hunger, even after eating, for about 6- 8 hrs. My downstairs neighbor and her 4-year old boy were on the stairs an hour ago. It was still dark outside and I was in bed. I heard her telling him to go up to his grandparents' for something. (They live on my floor and he would have to pass by my room first.) His answer was: "I don't want to, I am afraid of the ghost". Her reply was "There is no ghost" and then they went upstairs together. I have never heard him speak of a ghost before. Since I have played around with a candle a few times lately, I was wondering if my actions could have attracted any incorporeal visitors? edit: I just remembered that my downstairs neighbors once said that ever since I have moved into the house, it is haunted. But they were talking in jest and referred to me as the ghost because they seldom see or hear me. So it could be that the boy only learned about ghosts on Halloween two months ago and picked up on this joke with the only difference that he takes it seriously. Hmm... I should go out more. Are there really influences Copper has on health that is positive when it isn't consumed directly? I've noticed shopping this year that they are pushing copper cookware. They are also filling copper in bandages. The knee brace I wear occasionally is copper-laden, and it does help heal my soreness, but I can't say it's because of the copper. Intuition says new snake-oil. But. Perhaps the conductivity of copper helps the bioenergy circulate over an area that would otherwise be too dense to allow for normal bio(electrical) flow. Sort of like a chakra reliever. Not a healer, but a bypass to create space for healing to occur in the area. Have you seen the little kid in person outside sometime or some other kids? Also the clothes you wear hoodie etc. dark clothes and maybe a grim face when the kids might have seen you out sometime. Then the rumors spread and they have made you a "ghost" to tease this particular kid. Other thing is if someone has recently died in that place or near it. Then there is that possibility of you attracting some form of spirit or other, demon maybe, unintentionally. Maybe some entity just wanted to check out what you were doing and perhaps trying to communicate with you. I don't usually have a grim face, quite the contrary. And children at that age are not likely to tease each other in that way. I haven't had visual contact with any of his friends anyway. The last interaction I had with him was when I came back from buying groceries. He and his mom were in the garage and I told him how cool his first bike was. I helped them adjust the height of the saddle, so that he could ride more comfortably. I noticed that he had difficulties with getting into motion, so I showed him in what direction the pedals need to be before mounting a bike. We called it the "power start" and he learned it immediately. He has also been in my room once or twice and also on the balcony. So he should know that I am no ghost. Though a few days ago, after barely seeing any sunlight for three weeks due to my night rhythm, I did look like a vampire. I guess we covered that theory then. I think I am going to have a chat with my landlords and their kid. For the second time now after the "I am afraid of the ghost"-incident , he went by my door and said my name followed by "...is my friend" to his grandma while walking down the stairs. I have not had much (conscious) interaction with him, at least not nearly enough which would account for a statement like this. And I doubt he means anybody else because he said it right when he was passing my door. I am really livid with myself now because I have not been recording my dreams since November. Could I have somehow interacted with him while I or rather the both of us were dreaming? It sounds like my unconscious is having more fun than me. Most ghosts associated with children are the ghosts of people that care... so they are not there to do harm, but to help. In the physical realm, opposites attract, but in the metaphysical, "likes" attract. So he may HAVE found a friend. When dealing with a situation like this, it is best to just treat a ghost as a common, everyday experience--not something special. If it is "special," the normal rules of communication and friendship do not apply and have to be created from scratch. If it is common, well, it's just somebody "cool" to interact with. That will allow the communication to take place in a friendly, fear-free environment.